Cannondale's historic one-room schoolhouse dating from 1872 has been creatively restored into a widely-acclaimed restaurant. Under the direction of renowned chef Tim LaBant, The Schoolhouse at Cannondale won the "Diner's Choice" award for best overall restaurant in Connecticut and was also featured on the Martha Stewart Show. 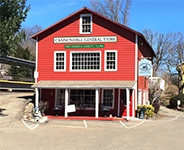 Having served as the village General Store since the Civil War era, this three-story historic loft building offers a wide array of unique New England arts & crafts, artisan foods, gifts, and souvenirs, as well as a full range of convenience items. Embrace Wellness treats the whole body and spirit in a nurturing and supportive environment. We understand that everyone is unique and we honor the special set of circumstances that has brought you to where you are today. Through Acupunture and Herbology we are committed to treating issues at the source and bringing the body back into balance as nature intended. Penny Ha'Penny features a unique selection of British goods, including food products, gifts, crafts, and original British pub signs. Annabel Green specializes in Old English flower-designs as well as unique gifts, crafts, clothing and jewelry items. The store is also a much sought-after provider of flower arrangements for weddings, special functions and homes throughout the area. 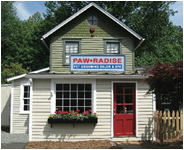 Paw-Radise is a very special pet salon and spa, where your pets are truly loved and cared for. We love what we do and understand that your pets are very important members of your family.